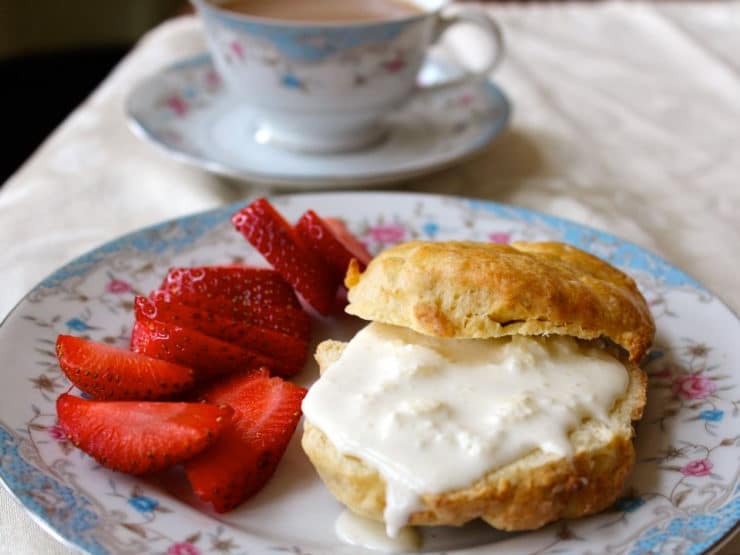 The Old Fashioned Way: Clotted Cream and Scones – How to make old fashioned British-style Clotted Cream and warm, freshly baked English scones. I have, and always have been, a voracious reader of English novels, and I’d often come upon references to “a cream tea.” This, I believed, was tea with cream in it until I reached the part where the characters tucked into scones and clotted cream. When I first traveled to England I had clotted cream myself, in a little teashop in Devon. It’s what heaven would taste like should heaven have a taste, I thought. And, as is my usual process, I then wondered how such a thing was made. To American ears, clotted sounds like something’s gone wrong. To us, clotted refers to a bodily healing process, so it’s hard to make the leap to something tasty. But in England, clotted simply describes the look of the cream as it clings together. 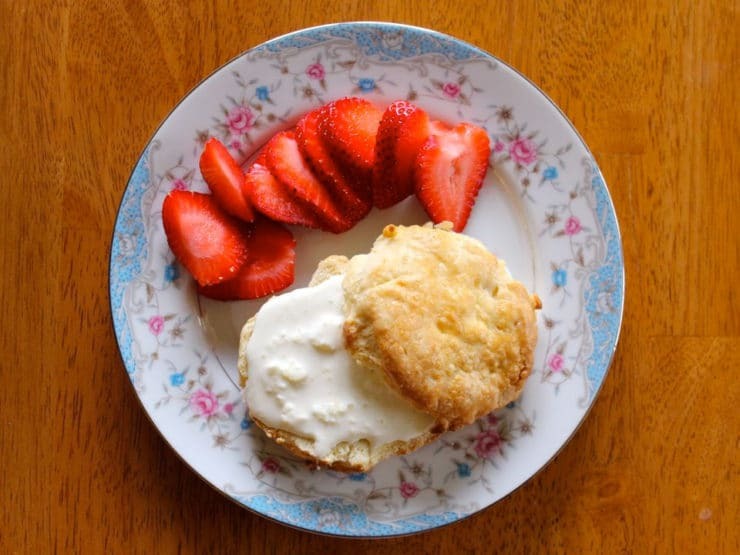 Once you bite into a golden scone spread thickly with this unctuous concoction, dotted with fresh sliced strawberries, you won’t care what it’s called because it is simply delicious. Clotted cream is also called Cornish cream and Devonshire cream (a nod to its geographical origins). Each area will claim that their clotted cream tastes different from any other. Devon’s cream’s flavor supposedly arises from the peat fires it is cooked over. I have to assume this is the way it once tasted historically, because in the UK today burning peat is frowned upon. Cornwall’s cream is said to have a coarser texture. Incidentally, Cornish Cream was awarded the EU’s Protected Designation of Origin status in 1998. In the past, clotted cream was also called clowtyd, clouted, clowted, and clawted. Clotted cream is hard to find, if not impossible, in the United States, but it is simple to make. It takes a lot of cream to make a small amount of clotted cream. Hmm, you might say, as you survey the small amount of clotted cream that is yielded, but understand that clotted cream is really the cream of the cream of the crop. A pint of cream makes a little less than half a cup of the good stuff. If you’re cooking for a crowd, plan accordingly and make multiple batches! 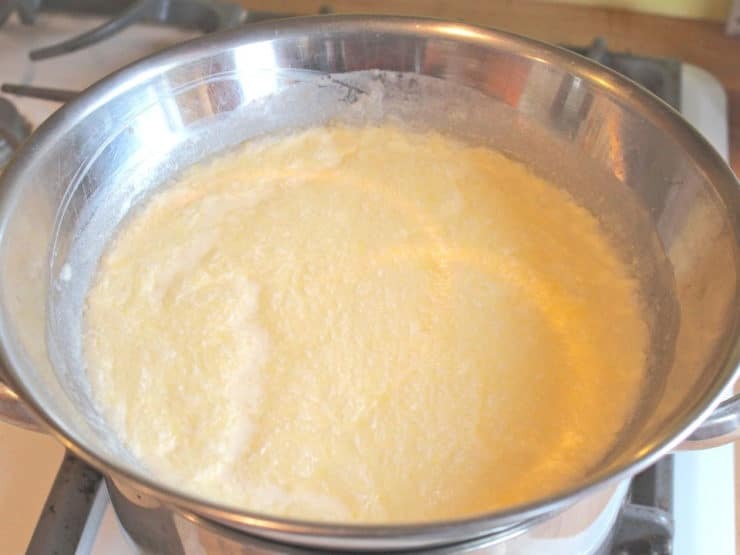 Use new milk and strain at once, as soon as milked, into shallow pans. Allow it to stand for 24 hours in winter and 12 hours in summer. Then put the pan on the stove, or better still into a steamer containing water, and let it slowly heat until the cream begins to show a raised ring round the edge. When sufficiently cooked, place in a cool dairy and leave for 12 or 24 hours. Great care must be taken in moving the pans so that the cream is not broken, both in putting on the fire and taking off. When required skim off the cream in layers into a glass dish for the table, taking care to have a good “crust” on the top. Here’s a simpler recipe, along with a recipe for a traditional English scone. Top a freshly baked scone with clotted cream and berries, and prepare to swoon! For Cream: a double boiler or heatproof bowl and saucepan, pan of ice water. In a double boiler over medium heat bring the cream to 175 degrees. If you don’t have a double boiler (and I don’t) place a heatproof bowl over a saucepan of water. Stir a little so that the cream heats evenly. Once you reach 175, bring up the temperature—180 to 200 degrees. Keep that temp for about 45 minutes to an hour. At this point the cream will take on a cracked, yellow skin. Next, remove the bowl or top of your double boiler and settle in a pan of ice water to cool quickly. Cover with plastic wrap and stow in the fridge overnight. Then carefully skim the clotted cream off the top with a shallow spoon and layer it into a bowl. It will keep for about a week in your fridge. Use the rest of the cream as you would regular cream (it will be thinner than heavy cream, but can still be added to beverages). Preheat the oven to 425 and prepare a baking sheet with butter or parchment paper. Sift the flour, baking powder and salt together and then work in the butter. Make a well in the middle and then add the egg and milk. Mix to form a soft dough. Turn the dough out onto a floured surface and then knead quickly until the dough comes together. Roll out the dough to an inch thick, then cut into rounds with a biscuit cutter or water glass. Move to the baking sheet and brush the tops with the beaten egg. Bake for 8 minutes or until golden. 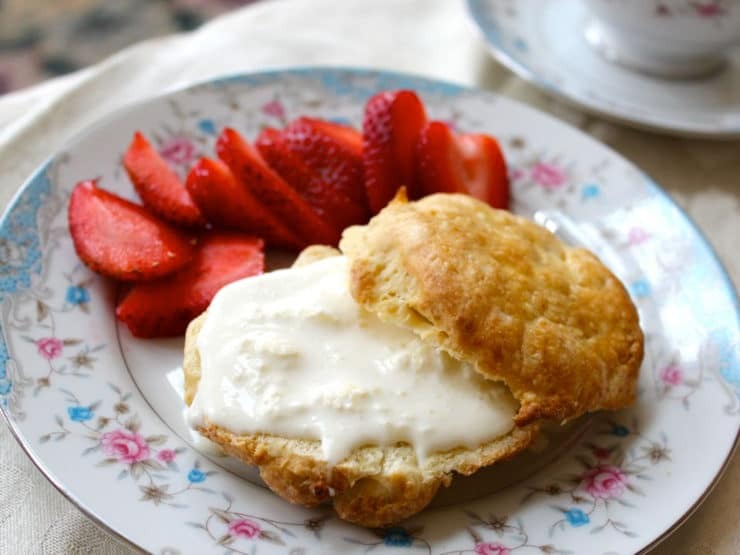 Serve your clotted cream with strawberries or jam on a scone, a slice of pie, or anything that lends itself to cream. Thorne, John (1996). Simple Cooking. North Point Press, New York, NY. McGee, Harold (1984). On Food and Cooking: The Science and Lore of the Kitchen. Scribner, New York, NY. Trewin, Carol (2005). Gourmet Cornwall. Alison Hodge, Cornwall, UK. Lane, John. In Praise of Devon: A Guide to its People, Places, and Character. Green Books, Cambridge, UK. I’m so happy to get the clotted cream recipe and can’t wait to try it! I’ve loved lemon curd since I was little and enjoyed it with my English neighbor. She gave me the recipe and I can’t tolerate anything from a jar! I never bought the cream, just assumed it would be the same. I will be trying that soon. My question, one comment mentioned that your scone recipe had too much baking soda in it. What’s the verdict? Was it a typo, or should I follow it exactly? Thank you so much for this fascinating site! Can’t wait to get more recipes! Also, maybe we’re related?? I have distant family on Isle of Man and England! Hi Nancy, this recipe comes from contributor Sharon Biggs Waller, who has had success with it exactly as written. Other readers have varying feedback. Sorry I can’t guide you on this! I will try to revisit this recipe soon to see if there are any improvements to be made. I made this in honor of the Royal Wedding of HRHs Harry and Meghan. and the clotted cream and it’s insane!!! My very picky son had two servings! I have never had anything so good- we ate them with strawberry jam. Super easy to make as well, just time consuming to create clotted cream. Thank you so much for this recipe! Theres too much baking powder in the scone recipe, probably by half. I would use no more than 1.5 tsp in this. Also, try adding 1/4 c sugar to the recipe. Otherwise, lovely! I literally went weak in the knees when I tried this clotted cream the next morning! I love this clotted cream recipe!! I think I futzed with the cream too much while it was cooking, so it didn’t set up amazingly, but I still had a lot of thickened cream. Plenty thick to use on scones. Now that I know where I need to set my stove to cook this, I’ll be able to not touch the cream and let it really cook. Also, after more research, a lot of people said to be super careful not to jiggle the cream when you’re moving it because it’ll impact the setting up. I dropped mine into the ice bath on accident, so much jiggling was had. Can’t wait to make it again! I’ll update after I make the scones! Can’t wait! I made the scones and was disappointed. The dough was very dry (I did use half and half instead of milk) and the scones came out very dry and tasting a bit like baking powder. Any suggestions? The clotted cream is amazing! I followed this recipe to a T and was disappointed. Let’s start with the cream. I figured that 1 qt of cream would not equal 1 qt of clotted cream, however, I did not expect such little production. What I skimmed off seemed only like 1/10th of what I started with. It tastes good, but unfortunately the majority of the cream left over cannot even be whipped…..
Now for the scones. If you follow the recipe, you will only end up with maybe 3-4 scones at best. In addition, I would highly recommend using super cold butter and milk (much like you would when making a pie crust). Sadly I did not do this and was left with hockey pucks instead of soft, flakey scones. Once your dough is formed, refrigerate for at least 2 hours to firm and then roll out. The scones will barely rise. You will also need to adjust baking time based on the height of your scones. Definitely with the cold-butter. Think of English scones as like American biscuits from the South. You can also purchase clotted cream from some stores or Amazon! Just for fun today, for the first time ever, I made some crumpets for my son and his family. My son, who worked for a while in London a few years ago, asked if I had any clotted cream to go with them! So I had to look up clotted cream online and found your website. It may be a while before I try to make the cream, but your scones and clotted cream and strawberries look delicious! I just wanted you to know how much I have enjoyed your article with all of the wonderful historical information, and the recipes, and the comments! It’s been very interesting reading! Thank you!! I am excited to try the full recipe. I noticed these biscuits with what looked like cream cheese topping and jam on a show about moving to the country in UK. I finally decided to look online to see what they were and it is cc with strawberries on scones. Thanks for your research and placing the historical nature as well. Looking forward to making and inviting some friends for tea and coffee mother’s day weekend. Thankyou for the recipe, I’m going to have a go at making it. The picture you have looks very different to what I am used to here in England though; I have never seen it so runny and bitty? It’s normally a thick yellowy creamy product, available in supermarkets and tea shops across the UK. I’ll let you know how it turns out! I watched two different results (coltted cream) from chefs on YouTube, both done in overn. One disguarded the whey & used the rest being the c.c. The other had no whey when folding off the top layer & he used all that was in the pan as c.c. How good this be???? When I made it I poured very little whey out and stired the rest. Was this the c.c.???? My second question- Put the results in a covered jar & then in the fridge, it harden so I took out what I needed & let it go to room temp. Was this the correct thing to do???? Very confused, Help Please. In Devon clotted cream was made by placing the freshly milked milk (from cows that gave high cream content milk, like Jerseys) in shallow bowls on the slate counters of the dairy till the cream rises, then heating it very gently for a few hours, and skimming off. I hope this produces something similar. You can get clotted cream in many stores now. The Devon Cream company imports a product called English Luxury Clotted Cream. Help! I am confused about the yellow (is it butter?) “crust” that develops on top of the cooked cream. When separating the clotted cream from the whey (or whatever it is that is left in the pan), should I mix this yellow crust into the clotted cream? Or should I remove the yellow crust and discard it? 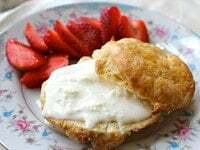 You shouldn’t remove the yellow crust-that’s the best part of clotted cream, just put the whole dollop into the bowl and then if you are making bigger amount of clotted cream put the next day’s batch on top of previous day’s batch without mixing or doing anything else. If you are making salty version, just put a bit of salt in between each layer, according to taste and that’s it! It keeps for many months in a cool place, the longer it ripens, the thicker, drier and stronger it becomes. It can be used straight away if you prefer it soft. By the way this is the way clotted cream is made and used in Serbia. Important notice: although very tasty, clotted cream is very unhealthy if large amounts of it are eaten at once. Basically, it is as concentrated milk fat as you can get, only butter is more fatty than clotted cream! As the recipe indicates the yellow skin on top iS the clotted cream that’s what you skim off and use. I will be going to England in July and hope to get to tast this. To me it sounds wonderful but dont think I want to try making it. Is OK to prepare the dough ahead and freeze them? Thanks! Make the scones, bake, cool, put into a plastic container and then freeze. When you need them, take them out of the freezer or take out as many as you need and thaw at room temperature. They will taste as if you had just made them. I love Clouted Cream (how my grandmother spelled it)! Just remember when making your cream…use a bowl that will not shatter when plunged into the ice water bath. I used to use an enameled metal bowl, but now I have a double boiler. Margaret is correct, this is a worthy try but bares no comparison at all to the real thing. It is just not possible to make clotted cream in the U.S.
Should be thick and golden with a definite crust and yes, a spoon should stand unaided in a bowl of it. It can be made. Many dairy farms and organic food stores sell a fresh milk and unpasteurized cream. I was able to find a place near me by computer search. You will know true clotted cream when a spoon stands up by itself when placed in the cream. Devonshire clotted cream also comes from cows that yield a much higher fat content (% ) in the milk than other cows. Hey Lauren! Great recipe, going to use it this week, but I was wondering; is the degrees fahrenheit or celcius. Thank you!! This post and the follow up comments are fascinating. Thank you! There is no way I can get freshly milked from a cow milk. Can you offer a substitute? Can’t wait to try this if I can find a way to do it and not sacrifice the flavor. You can simply use regular heavy cream from the market. Enjoy! Thank you so much for clotted cream recipe. Having moved from Scotland to America when I was seven, I had a Grandmother who taught me how to bake a proper scone. But I never did watch her make the clotted cream. 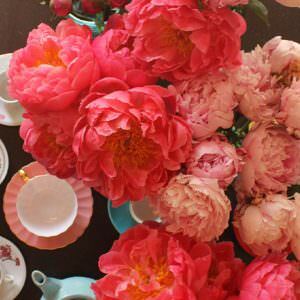 On Sunday afternoons, she would set up tea in the “with”drawing room, with fresh baked scones, her jarred jams, and clotted dream. It was heaven! I have to say now, that with your recipe, my clotted cream is awesome now. I did purchase a clip-on thermometer, and have marked the burner dial with a sharpie, as to the exact position, to hold the cream at 190 degrees. Also, have found out that the Costco Heavy Cream, yields more, and with a better flavor. Once again, thank you so much. I LOVE to bake and I especially love European desserts and pastries. I would love to learn how to make scones the right way. I made this recipe and the scones turned out great – very authentic traditional scones! I’m from Devon and well remember my aunt (a farmer’s wife) making clotted cream from raw milk in an enamel bowl. The cream was skimmed off with a perforated metal disc and, as you say, has a thinner, slightly runny component to it. The taste was devine and different from even the best shop-bought cream now, which tends to be too thick to spread. As to whether it’s jam or cream first, in Devon where I lived it was always jam first. I think the person who mentioned the cream needing to be thick enough to spread jam on hasn’t tried traditional clotted cream. I hail from the UK and now live in Australia. In all my time living in my home land I do not recall eating scones warm. I hate them served warm which is what happens in Oz all the time. The same with muffins. I usually by Devon cream in a jar from World Market for about 8 dollars. Today I tried your recipe to go with some bakery scones, and the clotted cream is heavenly! Less expensive and so much better tasting than store bought.Thank you so much! I tried the scone recipe last night, and I think there’s some kind of mistake printed here. I ended up with six super-tall scones that were uncooked in the middle. After about ten minutes of bake time, I lowered the temperature to 375, ripped them in half, and baked them uncooked sides up for another 8 minutes. I would advise rolling them to a *half* inch thick before cutting them out with a biscuit cutter. The taste was fine, though! Hi Elyce, thank you for the feedback. Sharon, who shared this recipe, is out of town at the moment but she will double check the recipe when she gets back and let us know if there is a misprint. Sorry your first try wasn’t quite right, glad the flavor was nice! I use sour cream and strawberry jam. As a British person, I’ve tried my fair share of cream teas: scones with clotted cream/jam and a cup of tea – with milk. Heavenly! Although I’ve never tried to make the cream myself, I’m pretty sure it shouldn’t look like the cream you show in your pictures (I would send it back if someone served me that – sorry if that sounds rude). The cream definitely should NOT be runny. It should be thick, spreadable and hold it’s form. Check out the wiki page (http://en.wikipedia.org/wiki/Clotted_cream) to see what it should be like. It should be a white, smooth, fluffier version of butter. If you try to spread jam on top of the cream here (as is the proper Devon way) you’ll make a complete mess. The cream should be thick enough that you can spread jam on top and it all stays together on top of the scone. No drips!! Sorry if this sounds condescending, but one shouldn’t give the wrong perception of something that is a British classic. JK, this blog is called The History Kitchen, we explore old fashioned methods of food preparation. Sharon is outlining the old fashioned farmhouse way of making clotted cream. It won’t look like the clotted cream sold in shops in jars because it is skimmed from fresh cream, hence the drips. It’s just a different method of producing the same product; the clotted cream you see here is actually more traditional than the thicker spreadable form you’ve grown accustomed to. For a thicker cream you could strain the gathered clotted cream through a few layers of cheesecloth. It is delicious either way. I bought Somerdale Devon Cream in a jar in a Canadian supermarket today and I’m so glad to have read JK’s reply. When I opened the jar, I discovered thick, spreadable cream. I expected it to be runny and thought that I had bought the wrong product for my soon to be British tea party. However, thank you JK, for now I know that it will be a success. the scone witch in ottawa serves some with ther scones and let me tell ya mmmm. good! I’ve never need to use a doyble boiler this long before – almost all the water boiled off and nearly ruined my pan! The cream looks good, though, it’s out in the fridge for tomorrow morning! Making clotted cream is very easy, if you can get non-homogenized milk – either direct from your dairy farmer or gourmet grocery stores. In a shallow pan bring the milk to a boil at medium heat, at which point a layer forms on the surface. Cover it with a wire mesh (we use a splatter screen) and let it cool a little before putting it in the refrigerator for several hours to overnight. We usually get about a half inch thick layer of clotted cream which can be carefully skimmed off the top. Since I live in Thailand and cream is not available here, apart from imported whipping cream. Whatever that is. I have looked for a recipe using pasteurized milk, which I can buy with 40% fat content . So the ancient recipe you so readily overlooked printed above your double cream recipe, to produce clotted cream, looks to be my best bet. Though, if it were clarified a bit more for me to use in my kitchen, I would be obliged to you. As I am dreaming of a lovely cream tea. Hi, third time making clotted cream. This time it’s gone a bit bitty is it because fatty layer on bottom when I put into another container? Clotted cream was recently listed as one of the 120 top items of British cuisine. See http://en.wikipedia.org/wiki/Clotted_cream. 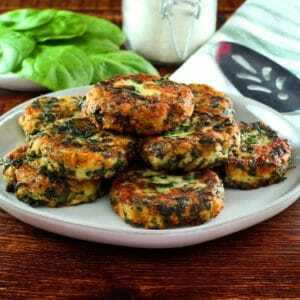 Subsequently it was ranked as the least healthy of those items, which translates to: it is delicious and good for you. Try it once at least. Might have to make this! Ever so glad Marks & Spencer is back in Amsterdam! Will visit them soon for the christmaspudding, mince pies and all other lovely british food. Clotted cream is not for sale in Holland too, but its easy to make. Mix 100 ml creme fraiche with 200 ml mascarpone, very gently, use a wooden spoon (no machine!) if you do well, you have a nice lobbed clotted cream within 10 minutes. Clotted cream recipe calls for heavy cream. Is this the same thing as heavy whipping cream? Hi im from Devon , where cream teas are very popular also in Cornwall and depending where your from ie ; Devon or Cornwall depends on how you eat cream teas in Devon they put the cream on first then jam , in Cornwall its the jam first then the cream . There goes my juicing schedule. not keen on the clotted cream but the scones sound delish! 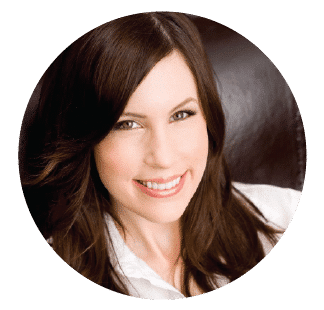 likes your site…I always enjoy reading your posts and recipes! Writing this from London, England. Marks and Spencer do lovely scones. Clotted cream is sold everywhere in supermarkets. The proper way to have it is to split the warmed scones in half across. Spread jam on it first then add a big dollop of clotted cream to top it all. Perfect with a strong cuppa (tea with milk). Utter delight. In the US, if clotted cream is difficult to find, use thick cream and whip it up. Pretty close to the real McCoy. Stacey Silverman, thought of you! Boy does this look GOOD! Why clot cream when you can whip it, whip it good! Cos clotted cream is completely different to whipped cream! You could use whipped cream in a cream tea, (Scones, Clotted Cream, Strawberry Jam and tea with milk) but the Cornish would frown on you and possibly accuse you of ‘cheating’. It simply doesn’t taste the same. The real question with a cream tea is do you put the jam or the clotted cream on the scone first?? Is clotted cream supposed to be the British version of American cream cheese? Looks more like cottage cheese beaten a bit and with perhaps that sour type of taste. Tell me if I´m wrong. Lauren, if you click through you’ll see the process for making clotted cream. It’s a thicker, clotted version of heavy whipping cream. The flavor is creamy, not cheesy or sour. Clotted Cream is 55% milkfat. The fat content is so high that it starts to clot. Clotting is just the cream globules combining to make curds, which are also the lumps in cottage cheese. The long heating time necessary for it to get to the 55% (or so) milkfat stage causes it to take on the characteristic flavour. Cream types are all basically made the same way and defined by their milkfat content. Common types of cream in the UK alss include double cream, which is 48% milkfat; whipping cream, which is 35% milkfat; single cream, which is 18% milkfat (this is the grade of cream immediately after separation and does not involve any reduction; half cream (aka half and half), which is 12% milkfat by the addition of whole milk to decrease the milkfat content. All these creams can be made from whole milk, preferably raw, though pasteurised is acceptable, but never using ultra-pasteurised milk (it will barely coalesce, aka clot, at all). Cottage Cheese is actually a soft, unaged cheese, that involves the same low heat as making heavier creams but involves the addition of rennet (creates large curds) or white vinegar or lemon juice (creates small curds) to cause it to acidify and curdle. The rennet method is slightly slower, but the result is less acidic. If the curds are washed, then it is sweet cottage cheese. If the curds are unwashed, and thoroughly drained, and often pressed into a dense lump, it is farmers cheese. If the milk is first ripened (mildly soured) and then processed to be farmers cheese, it is called Quark… and so on. Eric, clotted cream is clotted cream…not clotted (or “curded,” if you will) milk! The clotting occurs through a long cooking process (10 to 12 hours in a dish in the oven at a low (180F is about right) temp. The pan water method certainly works too. But the curds in cottage cheese are “milk” curds, entirely different animal. The first scones I ever had were in of all places Idaho! This small restaurant served them and it was love at first bite. The ones I have had since were dry and icky. This looks like it may be the same as the Idaho ones! Happiest part of my day today! It´s horribly hard to find clotted cream and I miss it from when I was in GB. Thank you! Very British. A must on any visit to Old Blighty. And now, thanks to the Shiksa, we may enjoy them here. I make brilliant scones, but clotted cream still eludes me sigh. Call it Devonshire cream, then, and enjoy it. It’s wonderful stuff. I first had it with fresh raspberries and a meringue in Ireland many years ago.